4 years on we hope that Ms. Pillay will view for herself the measures taken in the areas of rehabilitation and reintegration examples of which needs to be showcased as casestudies for even nations like and NATO who lack similar programs despite militarily invading nations on the guise of humanitarian intervention. § Abducting Tamil children as young as 10 years turning them into child combatants. § Denying Tamil children their fundamental right to education as well as what UN is doing about the 350 plus “Eelaam Madrasas” throughout Europe indoctrinating Tamil children to hate Sinhalese. § Forcing Tamils to commit suicide by taking cyanide – policy indoctrinating suicide is a criminal offence. § Denying Tamils freedom of movement, where throughout 30 years the LTTE issued passes for Tamils leaving the Wanni with permission given to leave only on medical grounds and for the elderly which depended upon leaving a member of family as “guarantor” or making a payment. Issuing passes to Tamils and keeping a computerized database of all Tamils living in Sri Lanka and overseas to take payments from them. § Forcible unpaid Tamil labour to dig trenches and construct bunkers which is against Geneva Conventions. § Using Tamils as Human shields – forbidding their release and the LTTE shielding themselves amongst Tamil civilians in the no fire zone as well as hiding their weapons amongst civilians which is a total violation of the Geneva Convention. We would also like to know why all the UN convoys that traveled to the North did not make a single attempt to persuade the LTTE to release Tamil civilians and not a single elderly Tamil or Tamil child or any sick was brought back in these UN convoys. Why did the UN not use their office to secure the release of the young and old Tamil civilians from the LTTE when they were on friendly terms with the LTTE? § Confiscating Tamil assets and property by the LTTE, inflating civilian figures so as to get additional food provisions to be distributed only among LTTE families. § LTTE’s killing of its own people where over 250 Tamils have been gunned down by the LTTE? – Has the UN investigated why the LTTE fired upon fleeing Tamil civilians and cut hairs of young Tamil girls to mislead the military into thinking they were the LTTE. This was an accusation by UNSG but not a single investigation was launched. § Despite numerous arrests and reports of the LTTE terror financing on foreign soil and kovils, charities, humanitarian organizations all operating as front organizations of such activity what proactive action has the UN taken to curb these terrorist activity? § When the LTTE has committed crimes under international laws why has the UN not taken action in 30 years? § The LTTE committed a crime under Common Article 3/1949 Geneva Convention and 1977 Additional Protocol 11 – confrontation with the SL armed forces as a “dissident” armed force under a “command”, controlling part of Sri Lanka’s territory illegally. § Third and Fourth Geneva Conventions/Additional Protocol 1/International Criminal Court declaration that “utilizing the presence of a civilian or other protected person to render certain points, areas or military forces immune from military operations” constitutes a war crime – what has the UN done against the LTTE for these violations? § Article 28 declares illegal the practice of employing human shields under IHL (Geneva Convention IV) “the presence of a protected person may not be used to render certain points or areas immune from military operation”. § Additional Protocol 1 to the Geneva Convention – Article 51(7) says “the presence or movements of the civilian population or individual civilians shall not be used to render certain points or areas immune from military operations, in particular in attempts to shield military objectives from attacks or to shield, favor or impede military operations”. This clearly applies to passive and active human shields whether they are voluntary human shields or not. * If the Sri Lankan military had been indiscriminately firing at the no fire zones since 21st January 2009 how did 11,000 LTTE combatants live to surrender themselves to the military and compromising the lives of 5000 soldiers to save 294,000 Tamil civilians? * Why did the Charles Petrie Interim report not mention about the LTTE suicide that took place inside a makeshift refugee camp where Sri Lanka’s military were providing food and medical assistance to Tamil civilians who had escaped the LTTE resulting in loss of military lives as well as Tamil civilian deaths? * In three years Sri Lanka resettled all 295,873 IDPs that Sri Lanka’s armed forces rescued – when there are 27.5m IDPs worldwide and refugees over 62m. The people of Iraq, Bosnia, Kosovo, Afghanistan are IDPs because of foreign invasion and foreign military intervention. Sri Lanka’s IDPs were because LTTE refused to allow them to safety. * Sri Lanka’s indigenous rehabilitation program has seen former combatants number 12,000 integrated into society and now engaged in meaningful employment while offering a Presidential Pardon to all the 594 child combatants – an achievement that no country has thus far considered. * Sri Lankan military has been involved in restoration of irrigation infrastructure, canals, tanks, revival of agriculture and farming, restoring over 1000 schools and healthcare facilities (none of which the LTTE spent a cent out of its $300m annual profits). Sri Lanka’s military has restored, renovated and even built numerous kovils and today has built a good rapport with the Tamil community evidence of which anyone visiting Mullaitivu will witness. Areas that never had electricity now enjoy light. 1. If Tamils can live in the South with the Sinhalese why cant Sinhalese live in the North with the Tamils? a. RIGHT TO FREEDOM OF MOVEMENT enshrined in Article 13 of the Universal Declaration of Human Rights? 2. Where are the next of kin of the supposed inflated numbers killed by the Sri Lankan armed forces? Surely even after 4 years the relations of the 40,000, 70,000 and the exaggerated figure of 125,000 should by now have given names, addresses and other details of the dead. It is only they who can provide any credibility to the allegations being made. a. The state of Tamil Nadu launched separatist agenda well ahead of Sri Lanka on the premise that the state was not part of ‘India’ until the British combined territories to declare India as ‘India’. b. With 65million of the world’s 72million Tamils living in Tamil Nadu where its state name denotes – Land of Tamils, where Tamil is the official language, where political power is in the hands of Tamils, where state patronage prevails for Tamil culture and all that is indigenous to the Tamils – this is where Tamils have every right to declare the homeland of the Tamils. It is naturally where they feel safe amongst their own people who are the outright majority despite of the imbalance to poverty and other differences like caste and discriminations that prevail. Therefore, in a world where an indigenous race such as Tamils do not have a state to call their own. That state with 65million has to be in Tamil Nadu not Sri Lanka where Tamils are a minority race of just 2million or less people. This grievance of world Tamils has unnecessarily created tensions in Sri Lanka therefore it is time the aspiration of the Tamils is addressed and the question is put to India to answer by Ms Pillai herself. a. Why more Tamils live amongst the Sinhalese than they do amongst themselves in the North. Why more Tamils live outside of their supposed Homeland area. 6. 6th amendment to Sri Lanka’s Constitution – Has Ms. Pillai’s office appraised her of the 6th amendment to Sri Lanka’s Constitution and its relevance to the behaviour of the TNA parliamentarians travelling overseas to meet up with and deliver speeches at events organized by LTTE front organizations. Would any foreign government tolerate if its MPs were attending events of proscribed parties and delivering speeches atop stages working in contravention of the country’s constitution. By virtue of TNA manifesto which espouses separatism it is violating Sri Lanka’s Constitution. 7. 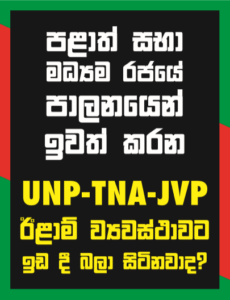 TNA manifesto violates Sri Lanka’s Constitution: The manifesto of the TNA is clear. It wants to separate, it espouses a separate Tamil Homeland – these are clear violations of the Constitution and TNA must be told that they have to remove every clause that violates Sri Lanka’s unitary status. In fact any individual, organization, political party, politicians propagating separatism, sponsoring separatism, collecting funds for separatism should be dealt with by the law of the country for they are violating the Constitution. 8. Does the UNHRC work only on behalf of the minorities? What about the grievances of the majority. Did the majority not loose lives, tragically cut short by terrorists, did the children of the majority not die and are their deaths not to be mourned, did the majority not get chased out of their lands and villages or succumbed to hacking by LTTE terrorists? We would like to know the stand of Ms. Pillai about the suffering of the Sinhalese? 9. Protecting Indigenous Sinhalese Race/Culture/Language : With only 14.8million Sinhalese in the world, speaking a language called Sinhalese spoken nowhere else in the world, cultures, traditions and customs practiced nowhere else in the world and exclusive to Sri Lanka it is now time for the Sinhalese ethnic group to be provided international protection vis a vis the preservingl of its language, its culture, its traditions and customs. 10. Are soldiers not human? Given that we dealt with a terrorist entity and various foreign governments and international bodies enjoyed molly cuddling with the issue for their own reasons what happened as a result was that the soldiers ended up being crucified. Following orders based on ceasefires and negotiated settlements meant that the LTTE terrorists who do not sign treaties or abide by them had the freedom to shoot down scores of soldiers some of whom were unarmed and some travelling on buses injured and unarmed. The numbers that were killed unarmed and injured is a violation of the Geneva Conventions – why have these never been part of any discussions past or present? 11. What does the UNHRC propose to do about LTTE front organizations that continue to lobby separatism? These organizations are very much active and continue to openly lobby foreign parliamentarians and are even allowed into the halls of the UN on the pretext of being charity/humanitarian organizations though the fact that some nations have banned them shows a need to further investigate their activities at an international level for the likelihood of their connecting with other terrorist groups and starting terror in foreign countries cannot be ruled out. 12. India’s role in Sri Lanka’s Terrorism & War Crimes of IPKF in Sri Lanka: The nation to have first trained, armed, financially supported and even had its intelligence supervise Sri Lankan militant groups including the LTTE was India going so far as to allow Tamil Nadu to be used as a logistics hub where these trained militants even had open offices running. The accountability for such state sponsorship that resulted in 3 decades of terrorism in Sri Lanka has never been explored. It is time that the UNHRC that speaks volumes about accountability investigate India’s role in state terror. Also to be investigated is the war crimes committed by the IPKF on scores of Tamils, Sinhalese and Muslims indiscriminately shooting at unarmed innocent civilians including white flag crimes during the period between July 30 1987 to March 1990. 13. War crimes against Adele Balasingham – trainer of Tamil child soldiers: The nurse who set fire to the oath of hypocrites and decided to train Tamil children as young as 7 to kill others and then to kill themselves by handing over a cyanide capsule at the end of training is Adele Balasingham who is happily living in the UK. What about her crimes that left thousands of innocent people dead and hundreds more of the Tamil child soldiers committing suicide as a result of swallowing the cyanide capsule. Is it not a criminal offense to train children to commit suicide? Why is the UNHRC ignoring the criminal side of suicide terrorism? 14. Denazify LTTE-TNA : Upon the conclusion of World War 2 Allied Troops adopted a denazification program considering all Germans as Nazis. That resulted in more Germans dying as a result of the treatment by the US, UK than those dead during the war itself. Sri Lanka does not wish such for we believe that most Tamils condoned terrorism. However, the LTTE and its proxy TNA and the emblems and all else associated with them needs to be clearly vanquished from our memories for true reconciliation to take place. When LTTE supported the TNA to enter parliament, when TNA makes the same overtures that the LTTE made the only difference between the 2 is that the TNA is without the gun. Therefore, the UNHRC head should agree that all memorabilia associated with the LTTE must be removed. 15. Help the Tamils : Caste factor is the problem: As a Tamil herself, Ms Pillai will realize what it is like to be a high caste Tamil or a low caste Tamil and how that affects every aspect of life within the Tamil social system. What many Tamils do not like to admit is the prevalence of the caste factor in the whole terrorism plot. Many of the LTTE were low castes, some saw converting to Christianity as a means to break away while others turned to the gun and led to LTTE banning caste factor during its rule which saw a lot of cadres coming from low caste especially the suicide unit. These need to be investigated further to clearly identify exactly how far caste factor prevailed and continues to prevail amongst the Tamils – if ever they suffer discrimination it is by their own upon their own. Let us remind all that LTTE began its killing spree by first killing scores of Tamils – first with the assassination of the Tamil Jaffna mayor and then Tamil police officers on duty and later 250 other Tamils who were academics, politicians, civil society members excluding the ordinary Tamils that have yet to be counted. 16. Colonial Compensation for Crimes: The root causes of virtually all the conflicts that prevail is deepseated in the colonial system of divide and rule. The fact that colonial nations invaded, killed, plundered lands and stole the resources turning these nations to poverty needs to be finally addressed at an international level and not on a case by case basis as took place for the Kenyans. It is time that the former colonial masters come clean on their crimes, it is time the world knew some of the horrendous ways that Government policies of the British in particular put to death millions of natives and it is time these Governments compensated the former colonies as well as the families of the dead. 17. The Public of Sri Lanka does not want the Provincial Council system: Your office would give to you the scores of crimes committed by Provincial Council members of both Government and Opposition. That these Provincial Councils do not provide a service to the public of the Provinces is no understatement. It is a cost unnecessarily born by the taxpayers and should rightly be done away with. The systems that prevailed before the introduction of the Provincial Council system adequately addresses the administrative needs of the masses. This is what is important and therefore the district council system should be adopted removing the provincial council system altogether. 18. Your silence on War Crimes by US and UK puzzles us: US unmanned drones are killing scores of people across the Middle East/Africa and Pakistan. These drones are flown by orders of the military under direct command of the US President, if so does this not constitute a war crime? Why has the crimes committed by the US and NATO on Iraq, Afghanistan, Kosovo, Libya and presently Syria goes nothing beyond a statement from your office? Should the fact that US uses Depleted Uranium not be enough to charge them for war crimes? Why was no UN investigation appointed on France’s complicity in the Rwandan genocide or Libyan invasion? How about investigating why powerful nations are openly backing militants to usurp power from legitimate leaders violating Geneva Conventions? § When the world celebrated the death of Osama with fireworks and mass celebrations the UN Secretary General did not issue a statement asking the people not to indulge in triumphalism – but he did so when after 30 years the Sri Lankan armed forces finally eliminated a terrorist movement that had prevailed at times with the nod of foreign governments and foreign leaders. § Do we apologize for defeating one of the world’s most feared terrorist organizations? § Do we apologize because the West can no longer use LTTE as a forward to advance their agendas in Sri Lanka and the rest of South Asia? § Do we apologize because we have angered many an NGO who now have no reason to remain in Sri Lanka and whose livelihood is at stake? § Are we to apologize because a lot of other people who stood to gain while the LTTE prevailed and the discussions for political solutions meant that many were enjoying additional perks and privileges? § Do we apologize because a handful of Tamils using the Sri Lankan situation as a plank to obtain refugee status now find themselves called “economic refugees” and are being sent home? § Do we also apologize because those that made merry out of the troubles in Sri Lanka pocketing from the USD300million LTTE kitty are now having to devise other ways to keep the show running? § Do we apologize for creating an indigenous rehabilitation program and reintegrating close to 12,000 former LTTE combatants who now lead a life of normalcy. § Do we also apologize for giving a Presidential Pardon to 594 former child soldiers because the Sri Lankan state considered them victims rather than perpetrators? § Do we also apologize for putting these surrendered former LTTErs through proper education and vocational programs and allowing them to sit for the O/L and A/L examination and embarking on their careers or further education? § Do we also apologize for introducing these former Tiger combatants to society just as some laughed at the manner the female former tigers were modeling clothes on the catwalk? Would those that laughed at these girls prefer them to be holding guns? Are these people laughing because these former combatants were married in a marriage ceremony organized by the army, are these people envious that these former combatants are now singing, dancing and some involved in even acting? § Do we apologize for ending the war and ending the manner in which LTTE kidnapped poor and low-caste Tamils and turned them into LTTE child soldiers? The reason why these children never made the news was because of the rigid Tamil caste system and because NOT a single Tamil politician, NOT a single member of the Tamil Diaspora cared what happened to these child soldiers because they were not only poor they were LOW-CASTE – thus outcasts of Tamil society! § Do we apologize for taking vast amounts of loans some of which were supposed to be for development of the South and instead went to develop the entire infrastructure framework of the North that had been totally neglected by the LTTE and their stooges? § Do we apologize for giving electricity to Kilinochchi and Mullaitivu – areas where for 3 decades the people were denied electricity because the LTTE blew up the transformers wanting to keep the people in the “dark”? § Do we apologize for maintaining military presence in the North because we are well aware that the destabilizing operators are still hunting to carry out some type of covert operation? Are we insane to recall the military when we know the ground realities? And who says the military is not welcome in the North? The people of the North prefer the military amongst them far more than they want their own politicians and this is visibly clear in Mullaitivu. We are well aware what media campaigns are capable of doing and of media personnel who enjoy putting spins. § Do we also apologize for bringing normalcy to the entire country? For bringing peace, for making sure not a single bomb has gone off, for ensuring not a single assassination has taken place by LTTE in 4 years? 20. Give Sri Lanka room: The history behind the roots of conflicts often gets ignored. For both Sinhalese and Tamils the room to heal and the room to adjust needs to take place minus interference. Many of the organizations claiming to help are mere stooges for destabalzing nations. Their involvement directly and indirectly only adds to issues. No one can take away the fact that throughout 3 decades the ordinary Tamils, Sinhalese and Muslims were very much living together, working together, eating together and enjoying festivities and other cultural bonding – it was always the politicians and other stakeholders who wanted to project a problem that had their say. We now want all these players to leave the people alone to once again build trust and live together as they had.